This week I don’t have any new food trucks to feature, but I think that will change after this weekend. I only made it to Vegas StrEats last saturday night and didn’t take any pics (bad blogger, I know). But there are a couple food truck events this weekend that should be a good time, and if you’re in Vegas you should check out. 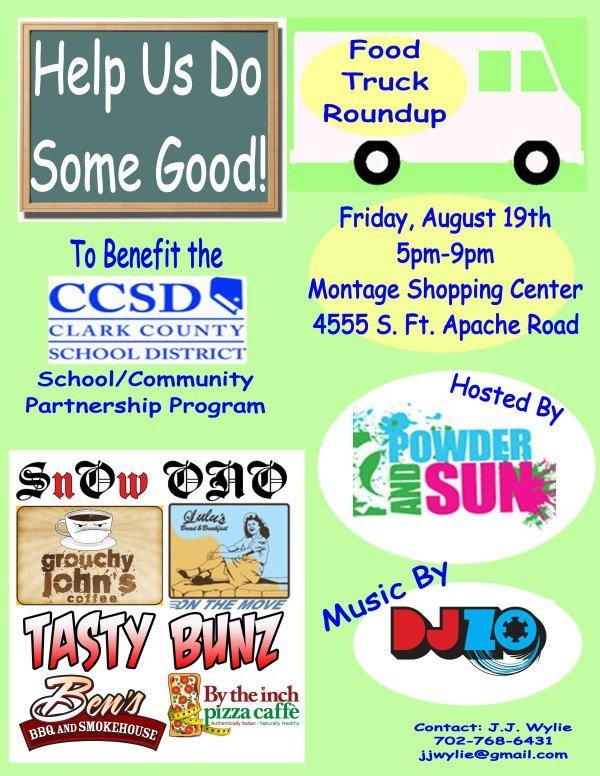 Today (August 19) there is a great event going on to get donations for school supplies for children in clark county that can’t afford to get them. It is located at Powder n Sun (a ski and skateboard shop) on Fort Apache, just north of Tropicana. It goes from 5 to 9. Some of my favorite food trucks will be there! Def go and support this good cause if you can!! I know I’ll be checking it out! On Saturday night I am finally getting to go to the Saturday Night Truck Stop that is put on by Sloppi Jo’s. I’ve wanted to go the past two weekends but haven’t convinced anyone to go with me. Fortunately I’ve had a couple friends agree to go! There will be some trucks I haven’t tried yet there (yes there are trucks in Vegas I haven’t tried). I’m pretty excited! I’ve heard great things about Saturday Night Truck Stop and I really just can’t wait to check it out. Jo has 6 food trucks coming out, plus the Cosmopolitan promo truck and Haute Chix Clothing Truck (I’m soooo sooo stoked to check out this new concept). The food trucks there will be Sloppi Jo’s, Haulin’ Balls (who I had a GREAT lunch from yesterday), Fukuburger, Food Slingers, Top Notch BBQ and Sin City Wings. What are your plans for the weekend? Have you ever tried a food truck before?